Would you pay $30 more per month for a medicine that may result in losing 2 pounds of weight per month? Would you take a medicine that causes diarrhea in 50% of the patients who take it, if it saves you $75 per month on the cost of your medicines? The answers to these questions depend on the patient’s financial situation, their values, and their priorities. Because we don’t know how a patient will respond to them, it’s important to ask. And by framing questions in terms the patient understands - dollars, weight change, or risk - we have the opportunity to create treatment regimens that improve patient understanding and adherence. We believe that healthcare providers can agree on a medicine’s performance characteristics when given FDA label data and published research. For example, estimating 1.2% as metformin’s HbA1c reduction as monotherapy, is likely a better estimate than 0% or 5% for most patients. Standardizing data is also helpful when discussing treatment risks and benefits. We can all agree that canagliflozin’s elevated risk of amputation has not been shown in other medicines in the SGLT2 class. All classes of of Type 2 Diabetes medicines have shown therapeutic benefit in patient populations. We believe providers should not universally exclude the use of any class of medicine unless required by the patient’s condition or preferences. There are at least 60 different medicines available to treat Type 2 Diabetes today. A provider may prescribe a patient 1 to 5 of them, based on the patient’s HbA1c level. There are almost 6 million different ways to choose “1 to 5” medicines from a list of 60. We can’t expect providers to solve problems that large. If we use standardized drug data and treatment rules, however, computers can help. GlucosePATH’s software considers all 6 million different treatment options for each patient, using the patient’s medical data, insurance coverage, and monthly budget. 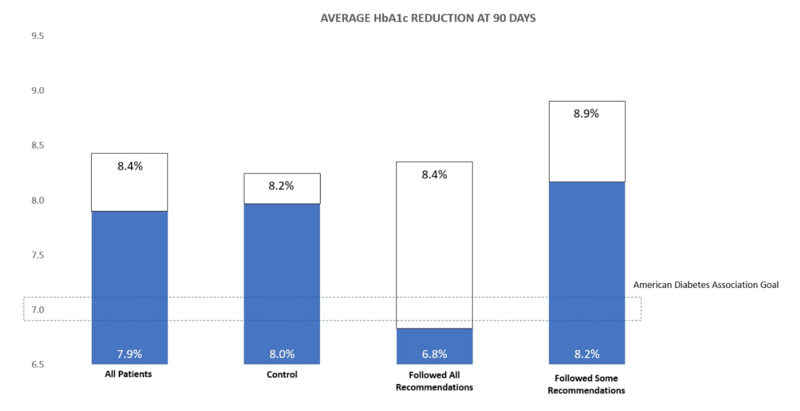 Patients who followed all GlucosePATH’s medication recommendations showed an average HbA1c reduction of 1.5% after 90 days. Patients who partially followed GlucosePATH’s recommendations showed an HbA1c reduction of 0.7%. GlucosePATH’s population health tools can optimize regimen, formulary, and carrier scenarios for thousands of patients at a time. In this case study we showed how a self-insured company could save over $1.1 million in annual prescription drug costs by eliminating redundant medicines, improving formulary adherence, and modifying employee medication regimens.